This mountain may most conveniently be climbed from the south, driving Hwy. 134 to the north side of Kvitingsvatnet. This location is south-west of the summit. 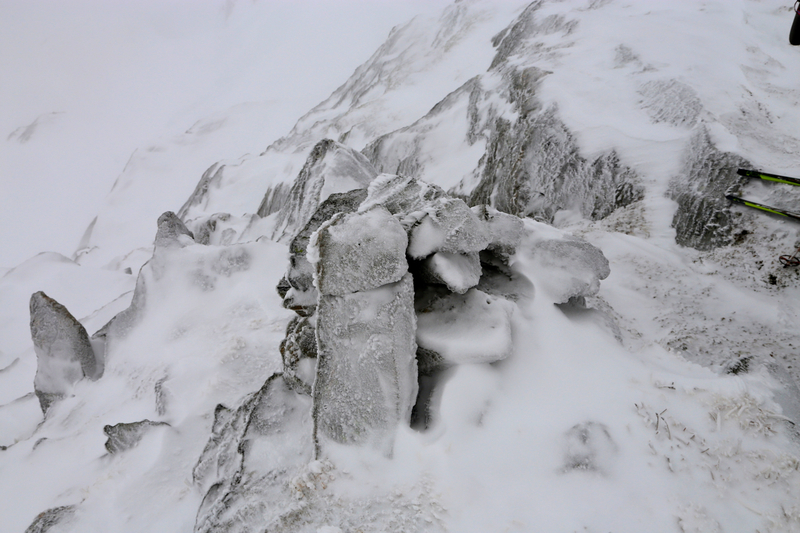 However, this report describes a ski ascent from the north using the DNT hut Gullhorgabu as a base. Drive E-16 from Bergen towards Voss. In Dale, turn right and follow signs to Bergsdalen. The trailhead is located at N60.54463, E006.03247, elevation about 530 meter. There is a small road going right here. Enter this road and immediately find parking on the right hand side (Parking reserved for people going to Gullhorgabu). There is also parking off the main road exactly opposite to this road, at least for 2 cars. Continue on the small road, cross the river on a good bridge, then follow shortly along the west side of the lake. An old military road heads steeply uphill (west). Follow this route up to lake Moavatnet, along its east side to Moastølen. The old road continues uphill to reach the small lake Grågavitjørnane. Continue directly south, up a small, distinct valley to reach lake Storlitjørni at elevation 820 meter. Ski across to the south side, then climb an easy slope to south-west. Continue along a natural route until this starts descending, move more east and follow natural routes to Gullhorgabu, located just north of lake Øvsta Dukavatnet. The Gullhorgabu DNT hut is a selfe serve hut with food supplies and capacity of 30 people. Its location is N60.50087, E005.96019, elevation 850 meter. In order to continue to the mountain, descend to the lake, then ski all the way to its south end. The broad north ridge of the mountain extends into the lake here. The first 10 meter of ascent is steep, the best place is likely a bit on the east side. Ascend south to about 1000 meter, then more south-west to the summit. The highest point s located near the north end of a fairly jagged ridge. This trip was totally unexpected. I had been attending a winter school in Geilo and had planned to ski a few summits near Hemsedal on Saturday and Sunday. 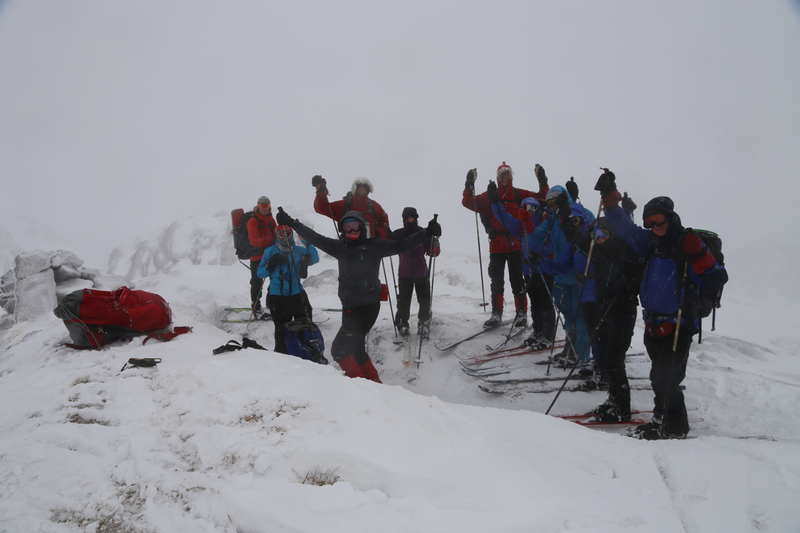 However, on Thursday evening I noticed a call for assistance from Bergen Turlag (The Bergen mountain trekking club), one of their guides could not participate in an organized ski-trip to the hut Gullhorgabu. This trip was scheduled to start around 1800 and (hopefully) provide the participants with a memorable ski under a full moon to the hut. Thus, a winter guide was needed. I thought this was a call I should respond to, thus I needed to drive back to Voss. I stayed at Geilo until lunch had been served, then drove across the Hardangervidda and to the agreed upon trailhead. 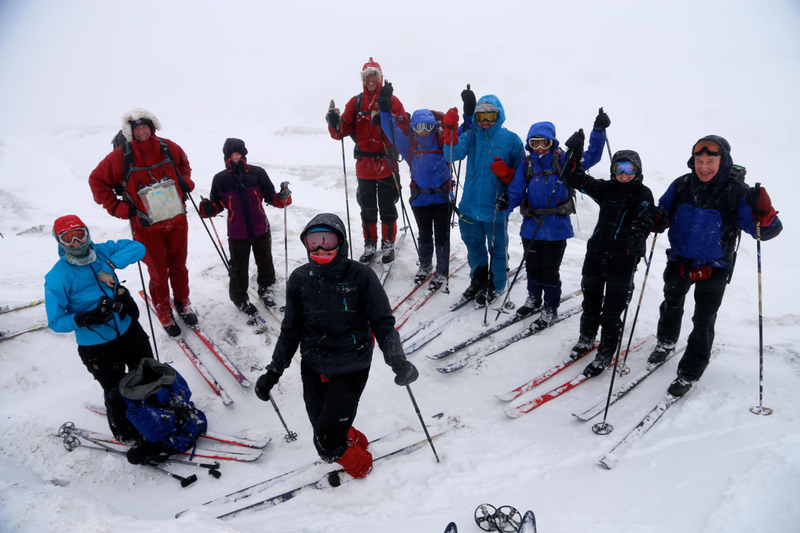 The group was a bit late, arriving around 1830 and we were ready to ski at 1900. The weather was completely overcast, no moon. Worse, the forecast called for some snow and a gale wind from the south, that is directly in our face. I had no map in my GPS, but had entered 3 waypoints the previous evening. Above the first hill, I told everybody (12 participants) to put on warm clothes, ski googles and protection against strong wind. I realized that this trip would be rather rough and I did not know how much (if any) experience the participants might have in skiing in a complete white-out with a blizzard headwind making progress quite difficult. We arrived at Gullhorgbu at 2230, 3.5 hours. Quite a few were tired, but happy to see that we had arrived. It was clear that this night ski-trip had been a very new experience for many. Breakfast at 1000, the weather was still bad. Still, all but 2 wanted to come along on a ski-trip planned to a nearby summit - Trollskardtinden, 1074m on the general map. We started at noon, with zero visibility I led the group uphill towards point 926. I noticed that we clearly were on the "wrong mountain", I had misplaced the waypoint late last night. Thus, ignoring my GPS, we quickly descended and skied across the lake to the proper ridge. The first 10 (vertical) meter were quite steep, skiing around to the east side, I located a route that would work for everyone. Reaching the summit ridge, I was fully aware that we should proceed a bit further south to find the 1074 point that I believed was the summit. However, up left looked pretty high and I soon located a cairn and measured the elevation to be slightly above 1080 meter. I declared that we had made the summit and everyone were happy. No visibility, but the wind was not as bad as yesterday. The time was 1345. Skiing back down was easy and we were all back at the hut by 1500. On Sunday, we started at 1115 and had an easy ski back down to the cars, arriving there at 1300. The weather was now very mild and the lower part of the track was completely wet with water running on the surface several places. Not good nor normal in January!